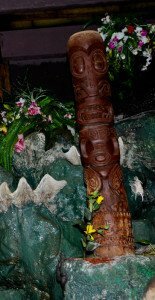 The arrival of new signature Tiki mugs marks the official opening of Trader Sam’s Grog Grotto at Disney’s Polynesian Village Resort this week. Also in the news is a seminar at Trader Vic’s in Atlanta, the new Tiki Magazine, the New England Tequila & Rum Festival, and a list of the 150 best bars in America. 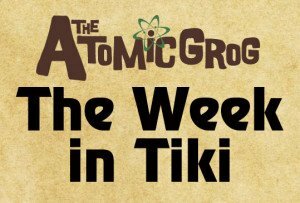 Weekly features spotlight artist Basement Kahuna, the Exotic Tiki Island website and podcast, exotica supergroup Tiki Joe’s Ocean, and the adventurous Oakland bar and restaurant Longitude. The rum of the week, Plantation Barbados 5-year-old Grande Reserve, is featured in Julie Reiner’s Plantation Mai Tai. 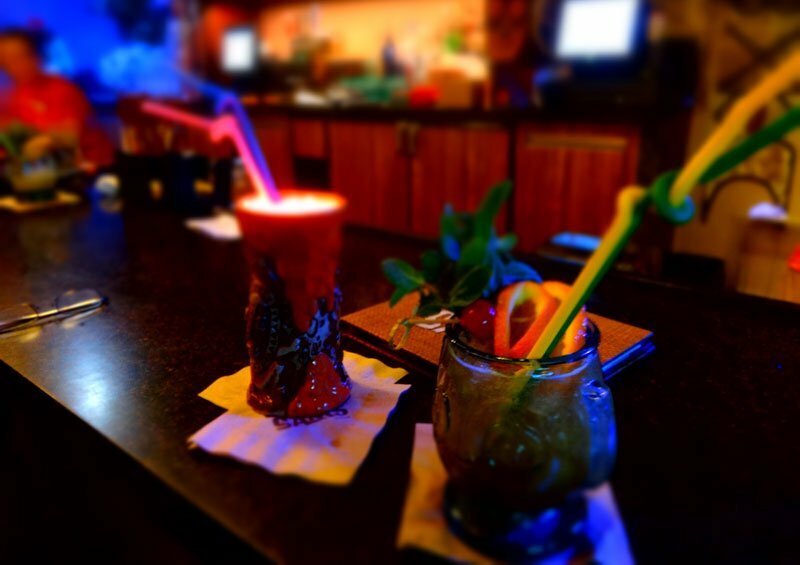 Trader Sam’s Grog Grotto has been entertaining guests since March 28 at Disney’s Polynesian Village Resort, but it didn’t “officially” open until Monday, April 27, when the Tiki bar’s custom mugs finally arrived. You can now take home the new Tiki mugs after drinking the Shrunken Zombie Head, Uh-Oa!, Krakatoa Punch, and Nautilus at the immersive, interactive bar and adjoining Tiki Terrace. 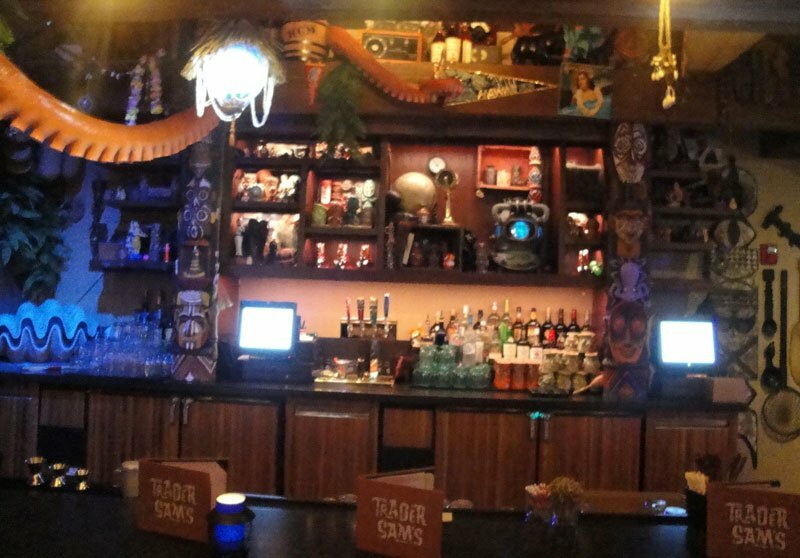 The first three drinks were imported from Trader Sam’s Enchanted Tiki Bar in Anaheim, along with the mugs. The new mugs are slightly different than their Disneyland brethren. 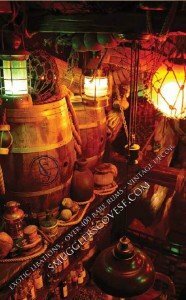 The giant Nautilus mug is unique to the Grog Grotto and is now for sale for the first time. The drink – a massive concoction featuring Barbancourt Pango Rhum, Appleton Estate Reserve rum, Combier Creme de Peche de Vigne Liqueur, tropical juices and falernum – is a tribute to the infamous submarine in Disney’s 20,000 Leagues Under the Sea film and extinct attraction. Also available for the first time are the shot glasses that accompany the rum flight (Bacardi 8, Pyrat XO Reserve, Ron Zacapa Centenario 23). You can also still pick up unique vessels that have been available since the soft opening with the Polynesian Pearl (a Grog Grotto original) and HippopotoMai-Tai (a favorite from the Disneyland bar that opened in 2011). 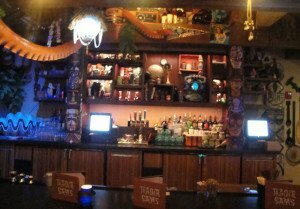 The new mugs will likely only keep the crowds flocking to the intimate 50-seat bar designed by Disney’s Imagineers to pay homage to 20,000 Leagues, the Polynesian Resort, and mid-century Tiki culture. More than 1,000 artifacts cover the walls and ceiling, and six cocktails trigger special audio and/or visual effects plus interaction from the bartenders (aka “skippers”). Like the Disneyland location, there’s much inspiration from the iconic Jungle Cruise attraction (and its “head” salesman, Trader Sam), the Enchanted Tiki Room, plus Disney World’s defunct Adventurer’s Club. Wait times can still regularly reach several hours, the Disney Parks Blog reports, but the outdoor Tiki Terrace can comfortably handle the overflow crowd with 82 seats, live Polynesian music and a newly installed lava rock waterfall. There’s also an extensive menu of exotic small plates (Hawaiian poke, Portuguese sausages, pork pate bahn mi sliders, etc.) at both venues, plus beer, wine and “Sam’s No-Booze Brews.” Operating hours are 4 p.m. to midnight, with the indoor Grog Grotto restricted to ages 21 and older after 8 p.m. The spring edition of Tiki Magazine & More is hot of the presses and should be in the hands of subscribers. 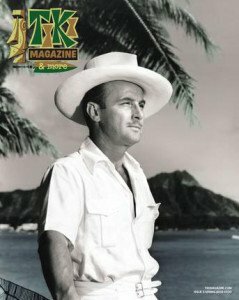 The fifth issue under the auspices of new publisher Amy Boylan features Tiki legend Donn Beach on the cover along with an extensive Collector’s Corner feature on Don the Beachcomber collectibles. Feature story topics include the late musician Ernie Menehune, the anniversary of the rebirth of Hollywood’s Tonga Hut, Beachbum Berry’s Latitude 29 in New Orleans, the Jungle Cruise at Disneyland, and the history of Fort Lauderdale’s Yankee Clipper hotel. Subscribe and get back issues at TikiMagazine.com. 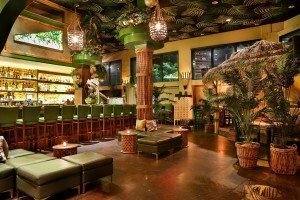 The Atlanta outpost of the venerable Trader Vic’s chain will be hosting a seminar on Saturday, May 9, by Paul Senft of RumJourney.com on the history of Tiki in Atlanta and the signature Mai Tai cocktail. The one-hour seminar starts at 5 p.m., costs $20 and includes a Mai Tai and shared pupu platter. Seating is limited, so call (404) 221-6339 to reserve a seat. Click here for more info. The Daily Meal website has posted a list of its 2015 picks for the 150 best bars in America. 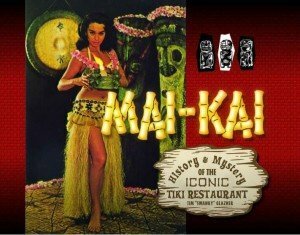 While such listings are highly subjective and always open to argument (The Mai-Kai is inexplicably absent, for example), this one is so extensive that it’s probably worth noting all the Tiki establishments that were deemed worthy, including many that have been featured as The Atomic Grog’s Tiki Bar of the Week (linked below). The Daily Meal’s picks for “the most iconic bars, famous pubs, and legendary cocktail lounges in America” in 2015 include Smuggler’s Cove (San Francisco) at 42, Pouring Ribbons (New York City, home of Tiki Mondays With Miller) at 48, Frankie’s Tiki Room (Las Vegas) at 64, the Tiki-Ti (Los Angeles) at 79, Kon Tiki (Tucson) at 84, Three Dots and a Dash (Chicago) at 97, the Mai Tai Bar (Honolulu) at 123, the Tonga Room (San Francisco) at 128, and Duke’s Canoe Club (Honolulu) at 139. The New England Tequila & Rum Festival comes to Lincoln, R.I., on Thurday, April 30, through Saturday, May 2, with samples and seminars on both spirits, live entertainment, food pairings and cooking demonstrations, a bartending competition, and more. The main event is Saturday at the Twin River Event Center from 2 to 6 p.m., featuring 64 exhibitors, including rum brands Appleton, Bacardi, Brugal, Clement, Cockspur, Cruzan, Denizen, Don Q, Kraken, Matusalem, Mount Gay, Plantation, The Real McCoy, Rhum J.M., Wray & Nephew, and Zacapa. And if you’re also a fan of tequila, this festival provides a great opportuity to combine both passions. Tickets are $35. David Wolfe, aka Basement Kahuna, is a carver and artist from Athens, Ga., known for his vast talent for replicating authnentic Polynesian styles (Maori, Fijian, Tahitian, Marquesan, Cook Islands, et al.). He’s equally adept at creating distinctive Tikis, war clubs, pendants, and bar decor. His work has been featured in bars across the country, from The Mai-Kai in Fort Lauderdale to Smuggler’s Cove in San Francisco. Fans will be happy to know that he recently started carving large Tikis again after an extended break from that medium. He has been intimately involved with The Hukilau since its inception, serving as a coordinator, seminar presenter and expert mixologist. A Tiki he created is the inspiration for the 2015 event mug (by Tiki Diablo) and pendant (by Perry Drake). 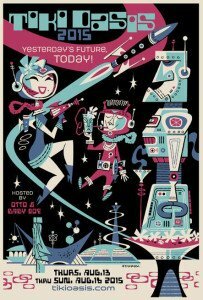 You can find Basement Kahuna at The Hukilau in Fort Lauderdale on June 10-14 showing off and selling his work in the Tiki Treasures Bazaar and mixing up a cocktail or two at select locations. Tiki Brian, host of a popular podcast that now numbers 36 episodes, is not content to simply play selections from his massive collection of vintage Hawaiian, exotica, island and Tiki music. 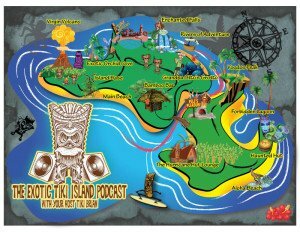 He creates a fantasy world (aka Exotic Tiki Island) inhabited by a cast of characters voiced by him and his friends, carefully scripted and professionally produced to provide a nice alternative to the typical DJ banter heard on most podcasts. More importantly, the music delivers the goods with an eclectic mix of classics (Martin Denny, Les Baxter, The Surfers, etc.) and new music from contemporary artists (Tikiyaki Orchestra, Kenny Sasaki & The Tiki Boys, The Tiki Delights, etc.). You can stream the show on the website in addtion to subscribing via iTunes. A new feature is ETI Radio, broadcasting all weekend starting on the first Friday every month via Mixlr. The next broadcast begins Friday, May 1, and continues for more than 50 hours. Subscribe to the ETI Newsletter and get regular updates on podcast release dates, cocktail recipes, artist spotlights and more. The brainchild of Seattle-based multi-instrumentalist, composer and producer Andy Nazzal, Tiki Joe’s Ocean is a modern exotica/Latin/lounge ensemble that has released four full-length albums since 2009. Under the Midnight Sun (2010) won a 2011 Hawaii Music Award for Best Exotica Album and featured an all-star cast of musicians including Dave “Squid” Cohen (drums/percussion), Mark Riddle (vibraphone), Jimmy Virani (theremin), Jack Aldrich (lap steel/Hawaiian guitars), Cudra Clover (flute), and Alika Lyman (guitar). The latest album, Soul of the Sea (2012), is a sophisticated, complex release featuring 30 instruments on its 10 jazzy tracks. If you’re looking for something new for your holiday music collection, be sure to check out Christmas With Tiki Joe’s Ocean (2009), featuring the band’s exotic take on such classics as Jingle Bells, Deck The Halls, and Silent Night. 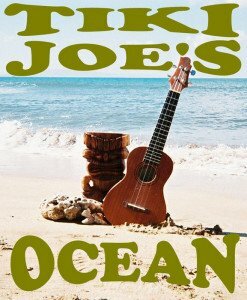 All the albums are available for purchase at TikiJoesOcean.com. Tiki Joe’s Ocean will be performing for the first time at Tiki Caliente in Palm Springs, Calif., on Saturday, May 16. This tropical-themed Oakland bar and restaurant – the creation of longtime Tiki mixologist and spirits educator Suzanne Long – opened to the public on Aug. 15, 2014. Long, a former bar manager at Forbidden Island in Alameda, brought to life a grand vision of an all-encompassing exotic experience that transcends Polynesian Pop. Sure, you’ll find such classic Tiki cocktails as the Mai Tai, Zombie and Navy Grog, but there are also many Long creations that take classic flavors in new directions, plus a hefty whiskey and spirits list that goes beyond rum. The menu of pub-style small plates runs a similar gamut, ranging from a pu pu platter to vegetable samosas and Shepherd’s Pie. The design and decor, created with the help of legendary artist Bamboo Ben, includes as much African-inspired art as South Seas. Long’s intent was to create an escape to a world of adventure, whether it be a safari or an exotic jungle. No detail was left to chance, including a custom audio system playing ambient bird calls. It’s hard to go wrong with any of the award-winning boutique rums from Plantation, which are comprised of aged rums from throughout the Caribbean that are shipped to France and aged again in oak cognac barrels. Several have already been featured as rums of the week, and many dominate awards given out at rum festivals around the world. For the second year in a row, Plantation rums won a festival-best eight awards at the Miami Rum Festival earlier this month. The 5-year-old Barbados rum, considered to be the workhorse rum of the Plantation stable, won a gold medal in the category of rums aged 5-8 years. It’s smooth, complex and flavorful, making it both a nice sipping rum and a perfect mixer for Tiki cocktails. It’s sweet yet dry and full of nuances: vanilla, caramel, fruit, molasses and more. As a bonus, it’s usually priced way below rums of similar quality. Shake with ice and strain into a double old-fashioned glass filled with crushed ice. Garnish with mint, lime and an orchid (if you have one). This recipe featured on the Plantation website is the pefect showcase for not only Plantation’s Barbados rum but also its Jamaican rum, which was featured last month. It has all the hallmarks of a great Mai Tai but with distinctively different rums. 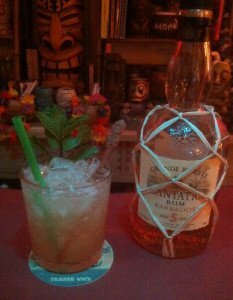 The funk of the Jamaican rum plays off the richness of the Barbados rum very nicely, and the drink has great balance that dials back the sweetness and lets the rums shine. Reiner is one of the prime movers of the New York City craft cocktail scene (Flatiron Lounge, the Pegu Club), and her Clover Club in Brooklyn is considered among the world’s top bars. (It’s No. 13 on the Top 150 list featured in the news story above.) Lani Kai was her late, lamented Hawaiian-themed restaurant and cocktail bar that closed in 2012 after a too-short 2-year run. This entry was posted in Art, Cocktails, Culture, Disney World, Events, History, Music, Other Florida, Recipes, Resorts, Restaurants, Reviews, Rum, South Florida, The Week in Tiki and tagged Basement Kahuna, Disney's Polynesian Village Resort, Exotic Tiki Island, Longitude, Mai Tai, Plantation Rum, Polynesian Resort, rum, Suzanne Long, tequila, Tiki, Tiki Joe's Ocean, Tiki Magazine, Trader Sam's, Trader Sam's Grog Grotto, Trader Vic's. Bookmark the permalink.